Have you been following along with my OSiS+ reviews and tutorials? If not, be sure to check out my other posts here! 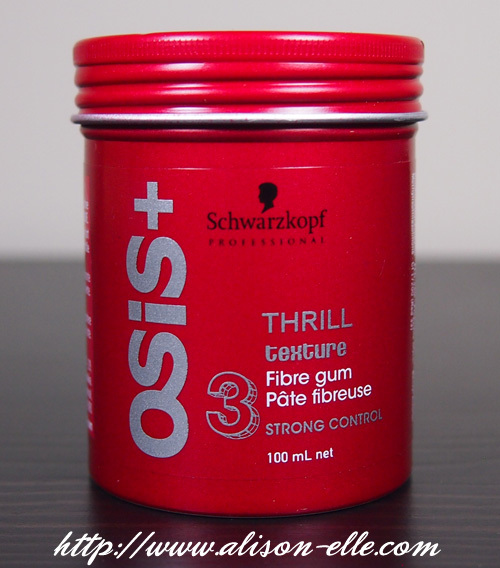 Today, I'm sharing my thoughts on OSiS+ Thrill ($23.50 CAD), a strong control fibre gum that can be used to add style and texture on short to medium hair. Way back in the day when I had super short hair that I spiked up in the back (this was when I was "punk rawk" obviously! ), Thrill would have been the perfect product for me. The fibres are fun to work between your fingers and you can easily define sections of hair for a piece-y look, adding shine without looking greasy. Plus it smells so good. Unfortunately my hair is much too long for products like this now so I've only been able to use it for taming flyaways. However, if you have shorter hair or a more edgy haircut, I highly recommend it. It's also great for guys - I've passed my tin along to my boyfriend who is just loving it. Yea,I'm on the same boat as you with the long hair. Although I love a good smelling product!! Seems like such a lovely beauty product! Thank you for sharing this with us!